This painting was commissioned by the Official Great Wellsville Balloon Rally Committee for use on T-shirts and Posters and other event advertising. It is intended as a tribute to the character of the event and the people who make it happen. The imagery also intentionally represents the phases of the balloon in flight from inflation, to flight, to safe landing, and closing the day. THE ORIGINAL PAINTING WAS AUCTIONED ON JUNE 8TH AT THE EVENING UNDER THE STARS FUNDRAISER at the David A Howe Library in Wellsville, NY. 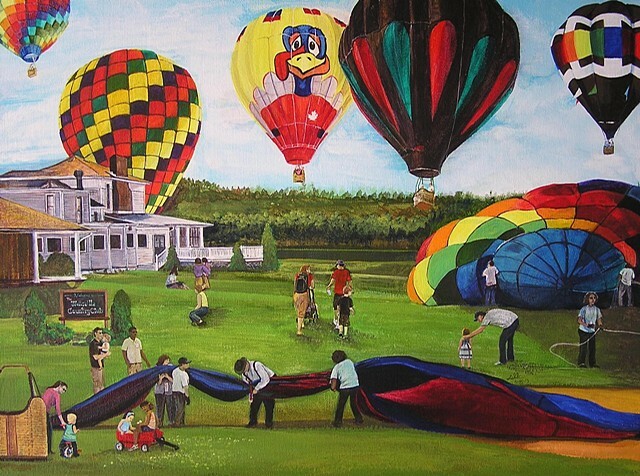 The Wellsville Country Club and golf course, a frequent landing site for annual balloonists, is also featured in the painting.